Do you like reading historical romance fiction (is that a genre??)? I do! If you like the novels by Jane Austen, the Bronte sisters, etc, then I think you might like this book. 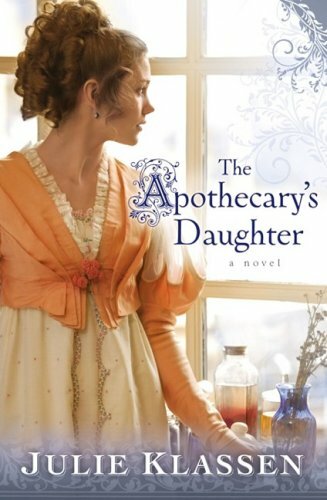 “The Apothecary’s Daughter” is based in England during the Regency era. Lilly Haswell helps her father, Charles, run his apothecary shop in Bedsley Priors; her mother left the family when Lilly was a young girl. Lilly’s estranged aunt and uncle suddenly come to visit, hoping to “adopt” Lilly’s brother Charlie as an heir to their estate, but then they find out about Charlie’s disabilities (based upon my limited medical knowledge, it seems like he may be Autistic) and decide that he will not work for their plans. Instead, they offer to bring Lilly to London to teach her lady-like things and to hopefully marry her off to a rich young man. In those days, women were not allowed to be apothecaries and her knowledge of Latin, medical terminology, and science was not seen as a good thing, so she had to try to keep that secret. Lilly is enjoying her time in London, going to parties and meeting potential suitors, until she gets a letter from a friend of her father’s asking her to come home because her father is “not himself”. When she arrives home, the apothecary shop is in shambles and her father is a mess. Lilly decides to stay with her father and tries to help him recover from his mystery illness and she brings the shop back to life. Throughout the story, Lilly has gotten herself involved with several men. I won’t go into too much detail about that because that’s one of the items that kept my attention… I wasn’t sure who she would end up with at the end. Lilly also struggles with new laws for apothecaries that go into effect which cause huge problems for the Haswell Apothecary. I know that I’m leaving out a ton of little things, but again, I hate giving out too many details because I don’t want to ruin the book for anyone who goes out and reads it. I really like books like this; I think it’s fun to think about what it would be like back in those days (and then think how lucky I am to be alive in this century!) and in other countries. Although I reference Jane Austen and Charlotte and Emily Bronte above, this book is not written the way those books are (from what I can remember from when I read them back in high school). The book is written in a way that is very easy to read with no fancy old-fashioned language to have to decipher. I also noticed when reading reviews that this book was sometimes classified as Christian fiction, but I didn’t notice any major Christian undertones like I’ve seen in other books. It just seemed like a good romantic fiction. Julie Klassen has authored several other books that seem to go along the same theme of Regency England. Haven’t read any of them yet but may put them on my list!